Hughton wants more goals at home. | NUFC Blog. 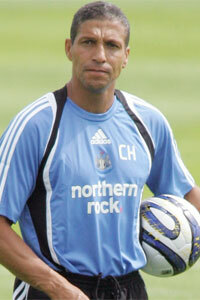 Newcastle United manager Chris Hughton thinks we should be scoring more goals in our home games. “I don’t think that it is necessarily the case that someone is due a beating, but we know that we can play better in front of our own fans. The return of Ameobi should help in terms of the goals scoring and apparently Hughton will spend this week finalising his January transfer targets. According to The Journal his main targets are Sol Campbell, Andy O’Brien and making Danny Simpson’s move permanent. Toon bits and pieces. Ashley’s new regime. No Sol. No Adidas. Villa manager confirms Harewood loan. Any other loans? Yup.. if we score more than them, we don’t lose! But we actually need more away goals. Then we won’t lose away either. But, in a nutshell, more goals required. Btw, not you lesh, CH. I was thinking that way too but hesitated cos the ‘if we score more than them’ even away, was KK’s (oh joy to watch). Then I wondered whether the ‘shut the shop’ when away approach combined with go for goals at home might be better suited to getting out of the Championship. But, now I think about it, CH appeared to be playing with caution even at home! So, Clint, I’ll go with you on this one – go for a bagful, home or away!! But i guess attack is the best form of defense, isn’t it? Generally, we win at home. a few more away goals would be good.